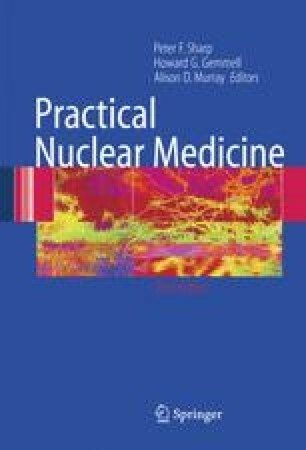 In nuclear medicine clinical information is derived from observing the distribution of a pharmaceutical administered to the patient. By incorporating a radionuclide into the pharmaceutical, measurements can be made of the distribution of this radiopharmaceutical by noting the amount of radioactivity present. These measurements may be carried out either in vivo or in vitro. In vivo imaging is the most common type of procedure in nuclear medicine, nearly all imaging being carried out with a gamma camera (see Section 1.3). Nuclear medicine is intrinsically an imaging technique showing the body's biochemistry, the particular aspect depending upon the choice of the radiopharmaceutical. This is in contrast to other commonly used imaging procedures whose main strengths are showing anatomy.